Skin tags, also known as acrochorda (or acrochordon, if there is just one), are small, benign tumours which tend to grow where skin rubs together on the body. 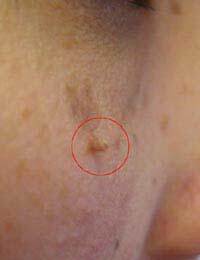 This means that skin tags often form in “creases” or folds of the skin such as the neck, armpits, under the breasts and groin, but can often be found on the face as well, especially near the eyelids. Usually skin tags are fairly small, about the size of a grain of rice, and are totally painless and harmless. Skin tags are quite common, but an excessive number of skin tags can be embarrassing. There are known contributing factors to skin tags, and fortunately, there are treatments and methods of removal as well. No one must suffer needlessly from skin tags. Skin tags are known to occur more often in association with a number of contributing factors. People who are middle-aged or older, overweight and obese and/or use steroids are all known to have a greater chance of developing skin tags. Being pregnant and/or infected with the human papilloma virus (HPV) also raises the risks of having skin tags. Some people may also find that skin tags are hereditary and run in the their families. Less frequently skin tags can also be associated with other conditions such as diabetes, polycystic ovary syndrome and Birt-Hogg-Dube syndrome. Skin tags are not contagious, and generally cause no other physical problem than being unsightly. There are a number of home remedies for coping with skin tags, and often these treatments are preferred when removal is deemed unnecessary because the acrochorda are benign. Over-the-counter medications which freeze the skin tags and allow them to fall off (much like at home wart removers) exist, and very small skin tags may even be simply scratched or rubbed from the body. Tying a piece of string or dental floss at the base of a skin tag and leaving it for about two days may also cause the tag to fall off. Cutting the skin tag just above the connection to the skin is also an option. Any at home treatment should be undertaken with care, however, as the risk of causing infection or otherwise harming yourself does exist. Skin tags, especially when they form in great numbers, can also be removed by medical professionals. Cauterisation (burning off), cryosurgery (freezing off), ligation (interrupting the blood flow) and excision (cutting out) are all possible removal options for skin tags. Currently there is no scientific evidence that removing a skin tag will cause more to grow, though some people do believe this old wive’s tale. For those suffering from excessive skin tags, removal at consistent intervals (once a year or even once every few months) is possible. Some people are more prone to developing skin tags than others, and some people are prone to developing an excessive number of skin tags. There are many reasons skin tags develop, and there are both at home treatments and options for medical removal.